Is that a good thing? Caroline going full-bore inhuman, I mean. (Not the mixed metaphors.) Evil control freak was wonderful, I thought. But just evil, with no control? That's just cruel, and murderous, and means Team Mystic Falls will inevitably be put in mortal peril soon and often, at the hands of their former friend. Meanwhile, Damon, Elena, Bonnie, and Kai went on a scavenger hunt for Mama Salvatore in an attempt to “fix one Ripper problem by unleashing another.” Mama Salvatore is interesting. Her enlightenment, compassion for her desiccated vampire friends, and two-drops-per-day phlebototalling (see, it’s like teetotalling, but with blood…) were rather unexpected. Her obvious preference for Stefan over Damon was more than a little sad. Her devotion to her “new family” just made me angry. But the time in the prison world led to some interesting developments. 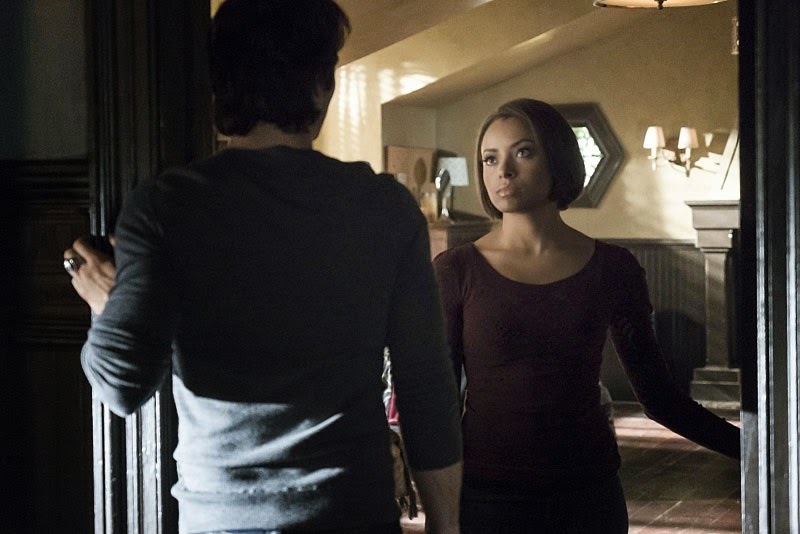 Damon’s and Bonnie’s scheming plan to trap Kai there was wonderful, although it took me a second watch to figure out exactly how that works: Kai doesn’t just need the ascendant. He needs Bonnie’s blood (or any Bennett blood). So, lacking a spare Bennett in the 1903 prison world, he’s trapped. Do I expect him to stay trapped? No. TVD is having too much fun with him—although the writers seem to like him more than I do. But it’ll be nice to have him tucked away for a while. And it’ll be nice to see him deal with some very, very hungry vampires. Karma, baby. I’m also curious to see what happens with the cure, which is suddenly back in play. I’d forgotten—or not known?—there was more cure to be had; I thought that the cure Elena gave to Katherine was the last bit of it. I guess not! I wonder who would want it now, though. Caroline, maybe? Sarah Salvatore, who just found out she’s a Salvatore and seems inevitably doomed? Everyone else seems to be enjoying their vampirism. • I loved the conversation between Jo and Alaric about baby names. But it also made me worry that someone would die soon, so they’d do the whole memorial-naming thing. • I also loved that we got a chance to see Caroline sing again. I'm on the "I hate Caroline evil" side of the fence, although it was easier to take this week what with her organizing everything to death, pun intended. I'm also enjoying Kai and even though I totally got why Bonnie did it, I was just a bit sad to see Kai trapped in time again. He's just too much fun to leave there. Mama Salvatore isn't doing anything for me yet. Especially since she likes Stefan better. Is Elena the only one who has ever chosen Damon over Stefan? I want Kai to stay!! They need to go back and get him... Kai was the best thing to happen to TVD this season. What's up with Enzo's electrocuted hedgehog hair-do?? Oh, Billie, you're right! I wasn't thinking with my time-travel hat on. It's a cure that now exists twice in this timeline: once, having been used by Elena, and now again, having not yet been used--or ever used--in the 1994 prison world. TJ: yes, everyone's hair was weird this week. I felt a little bad for Kai was he was probably experiencing a little PTSD himself at the idea of getting trapped (presumably) alone. But yay for Bonnie. I'm going to ship Bonnie and Damon because Damon and Elena have no spark anymore and it's hard to watch. Bonnie stabbing Kai makes them even, right? Because I'm just going to go ahead and call that ship. Maybe at the series finale, they can take off to Portland and make super powered Gemini-Bennett babies. I actually find humanity-less Caroline intriguing! I guess Josie and I are in the minority. I wonder if Kai can die in this prison world. It was never confirmed if only he couldn't die in the 1994 one. If he dies, then all the Geminis, including Jo and her baby, will die. It doesn't seem like they really thought this plan through, which is common in this show.